Which is better: working from photos or drawing from life? Life! There’s no comparison! 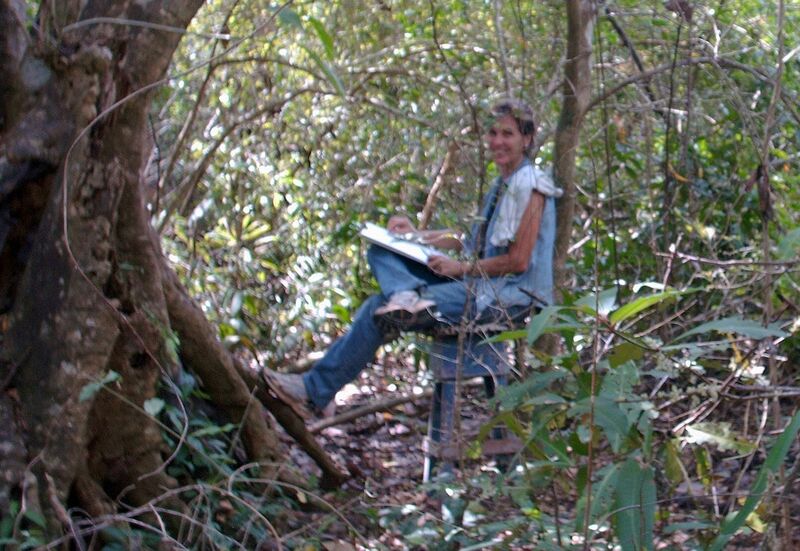 How I loved the time that I spent immersed in the dry rainforest while working on the above image. If one grows still, nature will reveal herself in subtle ways. 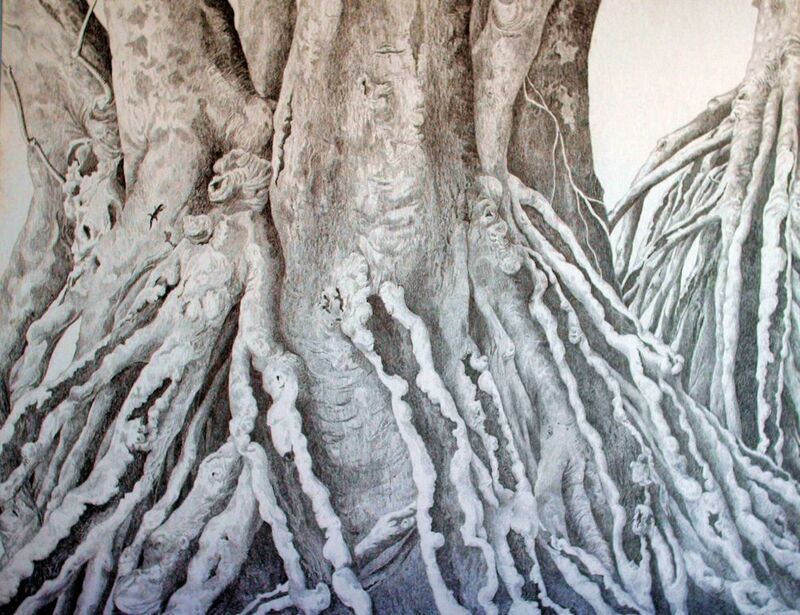 Pencil 24″ x 36″ – This gnarled old tree provided unique subject matter for many hours of drawing pleasure! As promised, I spent time drawing with my left hand! I discovered that mastery over the pencil or paint brush takes practice – lots of practice, and I had difficulties controlling the darks and lights and preciseness of the shading. I have always loved a good challenge, and I look forward to gaining more control over the pencil. Here is my first attempt at drawing with my left hand! After the first few seconds, I realized that I had little control over precise detail! Penny at The Why About This gets a gold star by her name for publishing For The Love of Art. See her drawing HERE and give her a thumbs up! 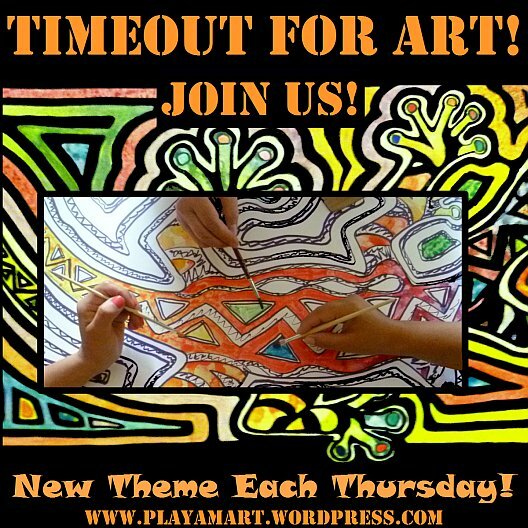 Thanks for your interest in this Timeout for Art series! I look forward to seeing your drawings! You are right; when drawing from life, one can lean to the left, to the right, forward, etc in order to decipher what is truly there. We can better understand the subject. You have captured the spirit of that beautiful old gnarled tree Lisa. I’m looking forward to seeing other peoples sketches. Pick something easy and master the low hurdles before you attempt a more complicated one. We’ll all be improving each week! Thanks so much, and I look forward to your post! that would be great to watch your transformation! not silly at all; refreshing! yes, but one has to start with the generic ‘student’ approach, and slowly over time we wean into a different , more subtle method. it is as if the pencil becomes an etension of our soul. Yes. I didn’t get the chance to do this yesterday. Will endeavour to do it today if that is still okay, or is it too late now? nunca! it’s never too late! you may post any time that the whim hits, and i’ll be happy for your place in our drawing club!!!! and you’re on your way! congratulations! you did well! but thank goodness i am stubborn and will not let the right brain win! i suspect that in a week’s time, i will have much more mastery over poor little weak left hand! Wonderful work also with drawings, and what a studio for work! yes, you are so right! i’ve always treasured outdoor studios! give me the sky as my ceiling! You certainly do like a challenge. I love the wee lizard on the tree trunk. when one gets very still, nature reveals many nuances that we’d otherwise miss! watching that cute little gecko oftentimes distracted me from drawing, but it wasn’t really the act of drawing, but the act of seeing that prompts me to return to scenes like that! The Act of Seeing; I like that. Geckos are often very friendly or unafraid. I wouldn’t have been surprised if it had come to SEE you if you were very still. ja! that does happen! i become so still that i am part of the landscape, as only my hand and eye are moving. i’ve startled some cattle before, and they broke through the fence in sheer terror- what a bizarre event that was! Love the trunk, the detail and shading is amazing. I’ll be posting. It may be interesting for others to see sketches from a “bebe” while I’ll certainly be “drolling” over the sketches of those who have been drawing a lot longer than I.
your drawings will surely be lovely! am about to be offline until tonight, but i look forward to seeing your drawing/drawings! Beautiful drawing. I started drawing (badly) a few years ago and found it to be the perfect solution to my inability to meditate – by drawing even when I couldn’t, I could meditate (break out of bubble). you are so right, and i’m glad that you stumbled upon the gift of drawing! it really does offer a beautiful window of peaceful respite. many times when i see an adult student struggling with a drawing or watercolor, i will say that, and it gives them more patience and tolerance. we forget that even the pro athletes were once novice players. practice practice practice is the simple answer to mastery. I also love the quotation, “All things are difficult before they are easy”. And what a wonderful exercise, learning to draw with your left hand. So often we fall naturally into the easier way of doing things – because of habit, laziness, a need to complete a project. Changing hands, or changing any of our routines, is a way of coming to fuller consciousness, participating more fully in the creative act. i don’t draw, and will not be trying. There are only so many hours in the day and my skills lie elsewhere. Still, you’ve raised a most intriguing question. What would be the writer’s equivalent of drawing with the left hand? There surely is one. It’s just a matter of finding it – and then giving it a try! bob of piran cafe is in the area, and i will present that question to him this morning! great question! more tonight or tomorrow morning! ha! try the middle row on the top, and the top on the bottom row, and the bottom row in the middle. we would have to rethink every letter! Absolutely love the first quote of Alain de Bottom. So true. Very nice pencil drawings. thank you so much! drawing always allows us to know something well. 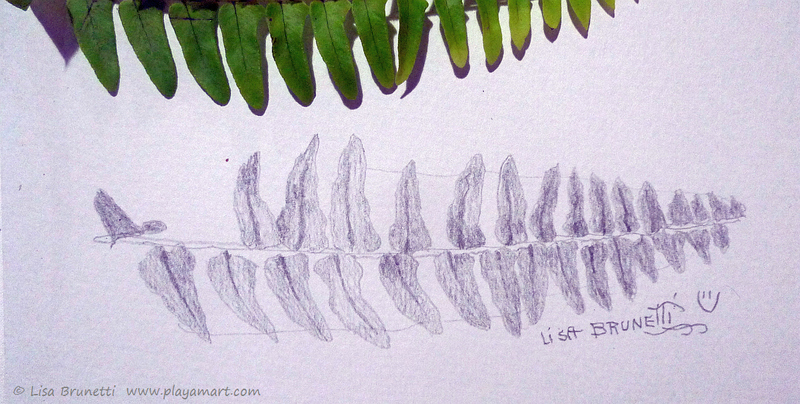 with the fern, i realized that one part of each segment of the leaf ‘sort of’ overlapped the stem, and in doing so gave it a nice poetic curve/rhythm. drawing also makes us slow down, and we soak in what we see! Oh, I’ve been waiting patiently for this post. I had one fail…just couldn’t sketch the mangoes without color..they seemed to beg for color. Now, how do I post my sketch? Do I just put a link here from my blog? yes, that would be great! i understand how the mangoes would scream for their right for color! bob of piran cafe is here, and yesterday we discussed his spacial plans for central america. yes, ometepe is on his list of places to visit. he will surely be in touch with you when his trail brings him closer! i’m about to be offline until tonight but look forward to your post! getting lots of practice using left hand. it is challenging but for the passion of art and all things connected…even the ‘seeing’…well worth the frustration. my dr. who i’m sure is related to yours….says ‘patience is a process’. thank you! you have my double sympathy now.. one can be brave and try with a positive attitude,b ut it is surely frustrating to have the knowledge of what you’d like to do yet not have the hand/eye cooperation to do it well! i am enjoying the challenge (i’m hard headed?) and hope to be much better with my left hand in another week. you have inspired me, thank you so much! my brain will stay young and healthy thanks to you! not sure i know how to post my own left-handed drawing but will put it up on my site with tag “Timeout for Art” and see what happens. I, too, hope to get much better…I have no choice but to……smiling!! i’m proud of you; it’s surely hard to stay positive when you’re learning to master the weaker hand/eye process. I don’t seem to have a problem with hand/eye…perhaps because I play piano?? It’s the skill level of precise-ness…is that a word? just posted can you see it? how interesting! i ‘tried’ to play the piano well when i was young, but it was not my gift! that’s an interesting theory! i’m going there almost now, but have to dash across one block and run an errand before a store closes.. i’ve been gone since tuesday and am not home yet! will be later tonight! Thanks again, Lisa, for the inspiration. Have a great day with Bob. I’m looking forward to meeting him on Ometepe. hey! thank you so much! i love your cultural pizza anad always love seeing fragments of ancient artifacts! this is going to be fun to see what everyone draws each week! Beautiful! Very nice, inspirational post and pictures, thank you! thank you so much! it will be great to see what everyone draws each week. i hope that you’ll join us!!!! Yes, this week I did…it was fun and traumatic at the same time! Thanks! hey! thanks for your great comment! i’ve used that quote from thoreau many times when people ask, ‘why ecuador’ or why latin america?… yes, we have to embrace our lives and destinies…. thank you so much! more when i’m home tonight! Thank you Lisa we should do things like this more often, I got off my comfort zone and try something new, and love it. For me it was so relaxing kind of like meditation, and it did not turn out to be as bad ;). We should start a group and post our work, choose a day and do it, give us some tarea (homework) it is so scary-refreshing. you did an amazing job, amiga! i love not only your right-handed drawing of the mariposa, but the one done with your left hand as well! we quickly learned how ‘one sided’ we’ve become, and now we are going to work on strengthening the other side! here’s to being “brain fit’ while having fun! Hi Lisa, your pencil renderings are excellent! I’m amazed at what you did accomplish with your left hand, as you say it is all about the practice of things. Lots and lots. Having said that you did extremely well with the fern leaves. You are correct, there is no comparison. Drawing from real life always over drawing from a photograph (when there is a choice, of course) . i look forward to more practice! thanks! i’ve always done many things with my left hand – riding horses, fishing, etc, but wow, holding a pencil took it to a new challenge! how great that you can switch back and forth! yes, i feel that way about the pencil in my right hand. isn’t it a great soothing feeling? Nothing better, nice to have someone else understand that sensation! you are so great with your tireless support! thank you! Actually I’m looking forward to seeing where this takes me. I like the idea so it’s the push that I needed. Off we go! Love your tree drawing and now the leaves that you’ve started. The story behind what we are seeing is great – look at you in the dry rainforest! you did an amazing job! buen trabajo! thank you so much for participating! Ms. Z, you have such happy relaxing soothing post. Thank the Gods for you. G’day Lisa well it is quite nerve wracking to actually put some thing up but I thought “why not” so here is my very first attempt, I’m know I can only improve but having the challenge to do it will get me practicing. i have just returned home after being gone most of the week, and wow, what a great place to start than with this comment! i’m on my way there and am so very excited that you’ve started your formal art training! yippeeee! Pingback: END OF MY ROPE… | Jots from a Small Apt. it’s so great that the trees have their very own fan section! thank you! do you have time to scribble a line or two? a stick man? a stick horse? i’ll bet whatever you do, it will be fun and great and original! So impressed by your drawing! you’re very kind! i credit a lifetime of practice! thanks! thank you, jack, for capturing the essence of a moving target!!! great job and great handling of your lights and darks! you did an amazing job! many people would not attempt to sketch a live animal! you did a great job! I guess perhaps it goes to Holmes idea of the simplicity on the other side of complexity! Our investment in the effort makes the end so much more satisfying!! While I am not an expert at using Photoshop or digital photography I have to say that things that seemed so difficult in the beginning are now second nature. I remember a brilliant chemistry teacher I had once who I loved but I felt her problem as a teacher was because she had lost all memory of being where we were in our understanding. I think a teacher has to be able to tap that link between complexity and simplicity or difficult and easy!! Maybe the left handed exercise is a way to access that link!! Ah well! I love this post and seeing that pencil drawing does engender the urge to draw. I drew a lot as a kid…birds, palm trees, horses…but never stuck with it and never got to the easy side for certain. So hmmm…..
yes, a good teacher must remember what it’s like to be a student, and i’ve always been surprised when i witness people who have no patience (empathy?) while giving instruction. artists are so very sensitive, and one harsh critique is often enough to crush the enthusiasm and rob them of their joy of creating art. yes, one mut be careful when teaching sensitive people. that’s a very good suggestion for a ‘left-handed’ writing approach. Well, I’ve been “absent” for almost a week now – unbelievable how much blogging & reading I have to catch up on. So LOVE LOVE LOVE this post!!! You know I would. The quote – yes, so true. The drawings – well, I love the tree, it’s beautiful. I like the way it pushes against the edges of the frame, the range of dark to light, the pattern repetition & detail that rests in a basically simple shape. Anyone would be lucky to have that on their wall to get lost in from time to time. But the fern was done leftie? No… How did your brain feel? I know you feel it when you do that, in an indescribable way, and it’s weird. I would love to join, but have a had a difficult week and need time to catch up with everything else. I will look at everyone’s drawings though. I like what Abigail, above, said that linked drawing with meditation. my week has been full but good, zero stress, gracias a dios! i drew with my left hand again today – i will now have empathy for stroke victims who are having to relearn their motor control. it’s hard. as if the message just doesn’t quite reach the fingertips. it’s also interesting how fast i improve.. i’ll do a row of shading, which is spastic.. the next row is better, and the next better.. and then i switch hands, and i realize that i have a lot to learn with the left hand! may the rest of your weekend go well! Yes, it is hard work to practice over and over again… to recognize the subtleties of the subject and how to translate them to the page… but the reward is surprising in itself, for the brush becomes an extension of the mind… and all the muscles and thoughts and considerations between the vision and the paper or the canvass eventually become part of the stream… part of the tide… like the air we breathe. And eventually we find that it is the mind that draws the picture. You’ve described the discipline very well, Lisa. So true! Painting is work for me; after a long session, I am tired. Drawing is like taking a long delicious nap; my pulse slows, and at some point I merge with the subject matter and am just ‘there.’ But I don’t have to explain that to you, do I?!!! What great details you drew!